Historical records are wonderful resources with lots of buried treasure. Of course, you have to dig for it – because it’s treasure – after all. Sometimes after reading these old records two or three times, I stop and ask myself, “What just happened here?” This was one of those times. One of the lessons we’ve learned with our continued studies is that the Native people did not remain in one place very long. They were always somewhat mobile, but the infringement of the Europeans hastened these moves…plus there were always enemy indians to worry about. This petition found in the North Carolina records gives us a huge amount of information. But first, let’s look at a bit of history about the Meherrin Indians. The Meherrin Indians lived on or near the Meherrin River near the Virginia/North Carolina border. The spoke an Iroquoian language, as did the Nottoway and the Tuscarora, who were considered their “cousins.” Historically they lived in Virginia above the fall line (Petersburg and Richmond), but by the early 1700s had been pushed south by European settlement. The following record tells some of their story. Whereupon by the consent of both parties It is ordered in Council That the Surveyr Genl or his Deputy do lay out unto the said Indians a certain parcell of Land lying between Maherrin River and Blackwater River Running three miles up Blackwater River and then a Straight Line to such a part of Maherrin River as shall be Two miles from the mouth thoreof and if the same line shall leave out the settlement of Capt Roger a Maherrin Indian that then the Surveyr Genl do lay out a Tract of 150 acres the most convenient to his Dwelling Which Land when Surveyed the surveyr is to make return thereof into the Sectys Office that Grants may pass for the same to the said Indians It is further Ordered by this Board that the sd Indians shall Quietly hold the sd Lands (page 645) without any molestation or disturbance of any Persons claming the same so as the same Persons Right or pretentions to the sd Lands be Reserved into them whereby they or those claiming under them shall have the preferrence of taking up the same when the said Indians shall desart or remove therefrom. Now is the time when I’m asking “what happened?” Let’s see what we can summarize. It’s obvious that the Indians are unhappy because the white people have once again encroached on land where the Indians lived, and have historically lived. This is a fundamental disconnect between the European idea that somehow the land was “available” for them because the Indians didn’t hold an English deed and the Indians concept of land usage without any concept of ownership. To them, the Creator “owned” the lands and they lived on them, used them, but never owned them in an English sense. The Meherrin lived in their town and have lived in their town near the Virginia/North Carolina border. The Indians have been tributary Indians to Virginia but Mauls and Gray are intruding on their lands saying they are in North Carolina. Maule and Grey surveyed their towns for land patents. 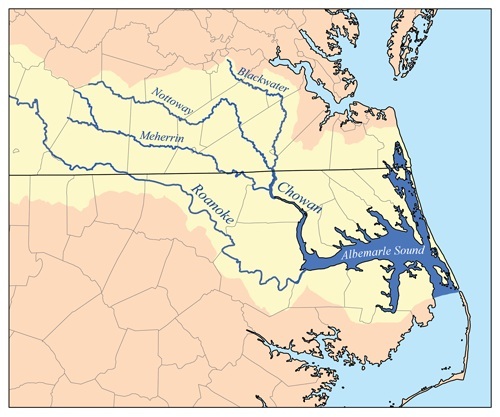 The Susquehanna joined the Meherrin and were originally from Pennsylvania and Maryland. They settled at the Old Sapponie Town upon the Meherrin near where Arthur Cavenah lives. They were disturbed by the Sapponie and went to live on Taruora Creek on the same river near Mr. Arthur Allen’s quarter. The Jennetto Indians drove them to Bennetts Creek. The Jennetto Indians were also Iroquoian. This seems to be a Sapponi term for the Seneca, also called Sinnegers and the Oneida Indians who roamed and struck fear into the hearts of tribes from Virginia through South Carolina. Bennett’s Creek was the location of the Tuscarora Reservation, although depending on when they were driven there, it may have been before the Tuscarora were granted this land. They moved to the Chowan River and settled at Mount Pleasant where Capt. Downing lives. Lewis Williams drove them higher up and they settled at Catharines Creek at a place called Little Town. They settled at the mouth of the Meherrin at a place called Old Meherrin Town. Nick Major, a Meherrin Indian was accused of being a Susquehanna and that he participated in the Degraffenreid Trial and the subsequent death of John Lawson in 1709, events which precipitated the Tuscarora War. Sickness came at this time and the Indians removed up the river of the land of the petitioner. I thought the petitioners were the Indians. This is confusing. Land laid out between Blackwater and the Meherrin Rivers 3 miles up Blackwater and a straight line to the Meherrin 2 miles from the mouth of the river. Unfortunately, when looking at a map, this leaves some question as to exactly which rivers were being discussed, because the Meherrin and the Blackwater are not adjacent. This entry was posted in Meherrin, Susquehanna. Bookmark the permalink.